A few years ago, an Asian-Mexican fusion restaurant opened in Muldoon. I liked this earnest eatery but its concept of fusion cuisine was … let's just say … haphazard. If fusion is meant to be a marriage of two compatible cuisines, this was more like a blind date: two perfectly nice cuisines that have no business sharing a meal together. I was sorry when it closed because it takes courage to try something new in the competitive restaurant world. But also because I will never not be amused at being served egg drop soup alongside chips and salsa at the beginning of the same meal. I was excited and hopeful to hear about the opening of a new Korean-Mexican restaurant, Seoul Casa, in South Anchorage. I met my friend Sue, who shares my love for Mexican food, Korean food, and spicy food in general, for a midweek lunch. She also avoids gluten and was excited about the numerous options for her here. The space, which used to be occupied by the cozy Terra Bella, has been thoroughly updated, and the gunmetal color scheme, bold black-and-white graphics, sleek unfussy mixtures, and large-scaled TV screens playing cheery K-Pop videos create a hip and youthful vibe. The thoughtful yet playful menu does the same. Most of the dishes are customizable according to your protein preference. The basic options are Korean BBQ chicken, kalbi, spicy pork, grilled shrimp or tofu. We began with kimchi tots ($14) with spicy pork. This dish comes smothered in onion, kimchi, cheese and barbecue sauce. It is, let's face it, a comically excessive dish. And we loved it. The tots are a crisp and pleasingly bland backdrop for the bright acidity of pickled vegetables and the absolute flavor bomb that is the spicy pork. with a decadently creamy and spicy dipping sauce, which I would happily ladle on many things regardless of culinary origin. Sue and I then shared the "Tres Amigos" taco trio ($13.50) and I also added a shrimp taco ($4.50) just to counterbalance all the meat. I was impressed that each taco didn't just offer a unique protein, but a distinct flavor profile as well. 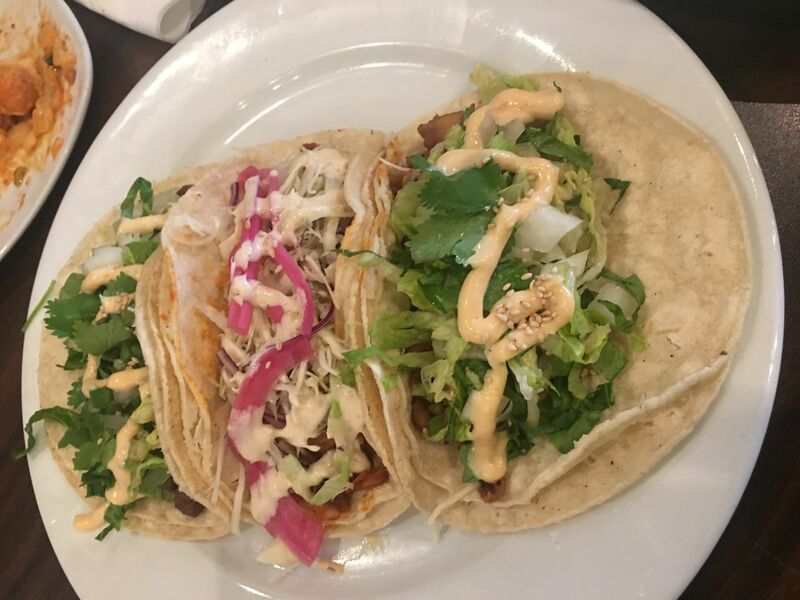 The kalbi and chicken tacos feature lettuce, cilantro and Ssamjang aioli while the spicy pork features house-pickled onions and a creamy sesame sauce. The shrimp taco was our least favorite but I think it suffered from being the last one we sampled. After the assertive flavor combinations of the first three, the mildness of grilled shrimp and avocado sauce translated as blandness. The poor shrimp didn't stand a chance. I returned the following weekend for dinner with my husband. The restaurant was doing a brisk business and we were seated in a little alcove off the main dining room. This space could use a little work. A fireplace, bold artwork, and cheerful lighting offset the cool minimalism in the main area; the side room, by comparison, feels austere and a bit dreary. We started with an order of chicken wings (these are offered three ways: naked, Korean Fire, or garlic soy — we opted for Korean Fire) and a dish I've always been curious about — Korean Corn Cheese. And it's a curious dish. Sweet corn is cooked with butter, mozzarella cheese, and smattering of onions and peppers. It's as straightforward as the name implies and if you had told me that it was a Southern American picnic staple, I would have taken you at your word. This is a universally comforting, homey dish. The Korean Cheesesteak with Bulgogi ($14) is a straightforward and well-executed sandwich but a bit unexciting compared to some of the kitchen's other offerings. I was looking for the heat or acid that is in such abundance on the rest of the menu. It's the dish I might recommend for a more timid eater. By contrast, we both loved the Kimchi-rito with spicy pork ($14). Stuffed with kimchi-fried rice, "Kimchi de Gallo" crisp vegetables and two kinds of cheese, this dish covers all of the bases: meaty, creamy, cheesy, spicy, cool and crispy. I've been thinking about this kitchen-sink dish ever since. My husband heroically found room for dessert – the intriguingly named "OG Fried Balls" ($7). This fever-dream of a dessert consists of deep-fried ice cream balls coated in your choice of one of three cereals. I repeat; deep-fried ice cream balls coated in three cereals. Because he is a grown man with a sophisticated palate, Marty opted for the Cookie Crisp coating (other choices are Frosted Flakes or Fruity Pebbles). This ridiculous dish is served with whipped cream and your choice of chocolate or caramel syrup. We chose both. Because freedom. I'd like to say that we ate this ironically, but that would be a lie. and soul (no pun intended). I'll be back.